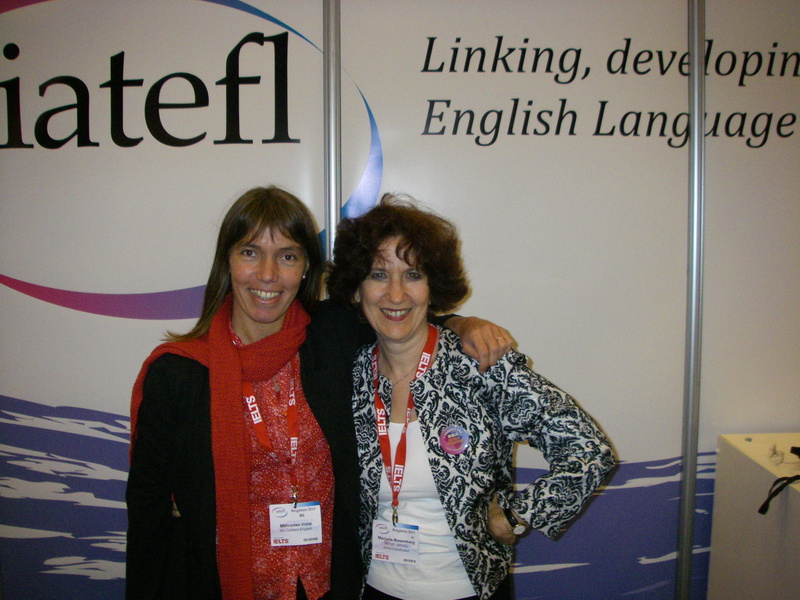 Marjorie and I met two years ago, at the IATEFL BESIG Summer Symposium in Paris. What impressed me about her was her enthusiasm about her work and her willingness to help out and run what was a great conference. She is extremely supportive to our teaching community and we are all very fortuntate to be connected with her. It is a huge honour to have her here on my blog. Enjoy our interview! Vicky: Marjorie, thanks so much for this interview. It is an honour to have you on the blog! Marjorie: It is an honour to be here! Vicky: Let’s talk about your journey into education. It has been a really interesting one. Could you tell us more about it? Marjorie: I actually studied music in Buffalo, New York and wanted to be an opera singer. While finishing my Master’s I took teaching qualifications as well and taught music in public schools for several years, before moving to New York City, where I continued with music by running a small opera company with a friend and working in advertising as my so-called ‘day job’. I then took a chance and moved to Europe to audition for the opera houses and, as I needed a job, I began teaching English in an adult education institution. Bit by bit, this became my new vocation and I continued my training in the field of ELT by taking numerous courses and going to conferences. Ideas I learned in those early days have proved to be the staples I still use in the classroom. Vicky: What a great story! Can you tell us a few things about your teaching currently? Where do you teach and what levels are your students? Marjorie: I now teach English at the language institute of the University of Graz. This institute offers language courses for all students at the university, meaning the students come from a variety of fields, and in some groups, from a variety of countries. This makes class discussions fascinating as students are experts in many different areas and can contribute new perspectives to the conversation. As a balance to university life I very much enjoy teaching adults and have corporate clients in our local bank. I have been teaching there as well some 25 years and work with people in different departments such as Human Resources or Project Management. The levels of the two groups are fairly similar, at the university I have students ranging from B1 to C1 as I teach both general English and a CAE preparation course and at the bank my students are mostly B1-B2. 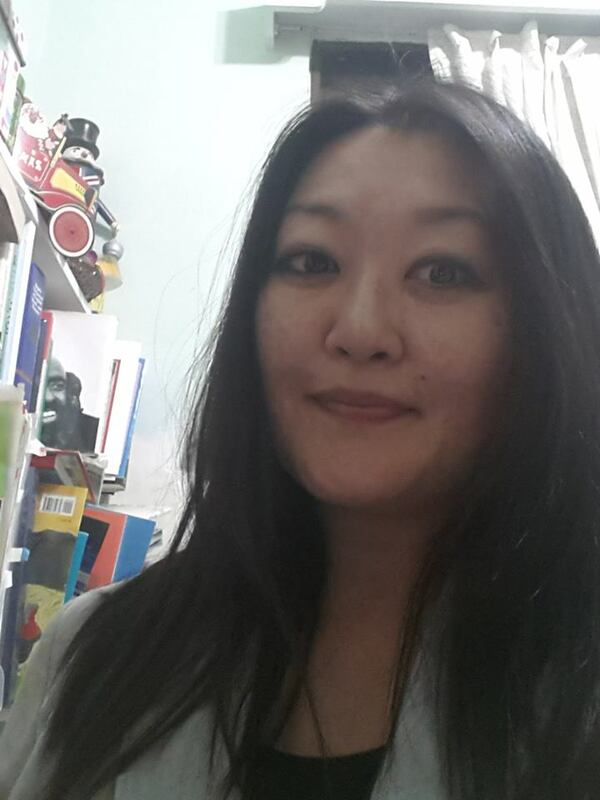 Vicky: So university teaching, and Business English! 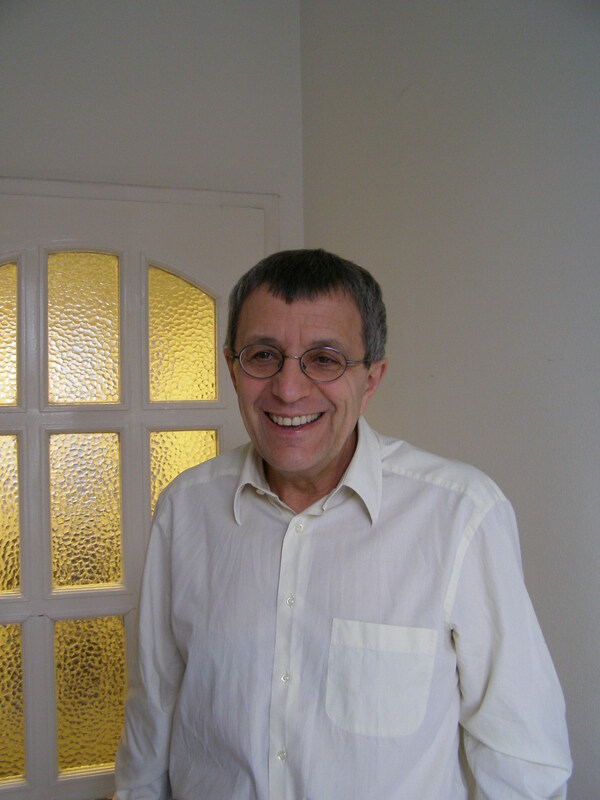 Speaking of Business English, I first met you at the IATEFL BESIG Summer Symposium in 2012, in Paris. How did you become so involved with IATEFL? You are now the co-ordinator of BESIG. Marjorie: I have been involved with teaching associations since the early 1990s when I first joined TEA (Teachers of English in Austria). I was quite active in the group and was Chair in the early 2000s. I attended my first IATEFL BESIG conference in Graz in 1995 and joined IATEFL at that conference. 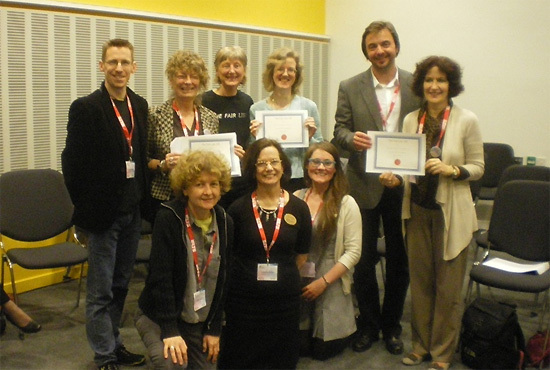 As IATEFL BESIG runs an annual conference every year, I found myself becoming a regular attendee and in 2008 joined the committee as one of the events organisers. I had organised events with TEA and this seemed like a great opportunity to get more involved with BESIG. In 2009 I was elected as one of the joint-coordinators and in 2011 as sole coordinator. Through the SIG-coordinators’ meetings I became more and more interested in the workings of IATEFL and when an opening became available on the Membership Committee I applied and began in that position in 2013. This has been a lot of fun as my job has been to organize the IATEFL webinar series which meant contacting people in the ELT field and setting up a program. What I am also proud of is that we have made the program quite diverse and at the end of last year, I officially applied for a Fair List Award for gender diversity in events in the UK. This was for the for the IATEFL webinar series. IATEFL BESIG had won one for our Pre-Conference Event in Glasgow in 2012. The other aspect of IATEFL I find so important is the chance to meet people around the world, like yourself, who are active and interested in setting up sharing communities of practice. In addition to supporting initiatives like the Fair List, I have also contributed to the lesson plan bank of the Disabled Access Friendly website, a non-profit organization which promotes awareness of those with disabilities through ELT. Vicky: What especially have you been able to do as BESIG coordinator? Marjorie: I am very glad that we have continued and expanded our online events. Carl Dowse, our last web coordinator, began the idea of our weekend workshops. These are online webinars run every month and are open to all. We then post the recordings for a week and afterwards they are moved into members’ area for them to view at any time. We have been able to reach a number of members around the world with this. And what is so fascinating is seeing how people connect in the chat box on the web conferencing platform and exchange ideas with each other. This helps as well to build a global community. We also began a scholarship for a ‘BESIG Facilitator’. This scholarship is set up to allow a BESIG member to travel to the annual IATEFL conference in the UK and the idea behind it is that the recipient will continue to work with BESIG when they get home. Our first award, for example, was to Mercedes Viola who has been a valuable member of the BESIG Online Team, was appointed to ElCom team of IATEFL last year and was just co-opted to be joint web coordinator with Claire Hart. Another idea to enable more teachers from other places to attend conferences was to offer highly reduced rates to teachers from specific areas to our annual conference rather than awarding full scholarships to only a few. This has been very successful and we were able to have a large number of teachers from former Yugoslavian countries at our conference in Dubrovnik, Czech and Slovak teachers in Stuttgart and now teachers from Hungary and Poland in Prague. We also worked together with the local teaching associations and they put people up in their homes as well. And the last initiative that we began in the last few years is our business English writing competition. This is open to all those who have not yet been published commercially. Winners then have their work published on the Cambridge University Press website, Professional English Online, and have the chance to win prizes. This extends our reach around the world and offers opportunities to budding writers of business English materials. Vicky: What do you enjoy about being a SIG coordinator? Marjorie: This has been (and continues to be) a very interesting experience. I discovered for myself how important it was to be able to delegate to the right people while trying to keep an overview of what is going on in the SIG. Another exciting aspect has been the creation of our ‘sub-committees’, the BOT which was started by Carl Dowse to help out with the online events and the BET, which was actually my idea. Although we have been holding annual conferences for over 25 years, we hadn’t published conferences selections recently and and it was thrilling to see the first BET publication, the Stuttgart Conference Selections in eBook format on both the BESIG and IATEFL websites. And the Prague Conference Selections will be coming out in a few months conference selections. But what is so interesting about getting these sub-committees together is that we have the chance as a SIG to involve more people in the running of the SIG and also develop talent. Committees often tend to consist of people who have been in ELT or IATEFL for quite some time whereas these sub-committees brought new people into the fold. They get an idea of how the SIG works and when it is time to find people for the committee we have some who have already been involved in helping out. The other part of the job that I like a lot is working with other SIG coordinators. It isn’t always easy coming in as a new coordinator as the job can be quite overwhelming and as I have been doing it now for a while it has been a pleasure to mentor some of the newer coordinators. There are so many little things that don’t need to be done from scratch and passing on the information can ease the transition from just being a committee member to actually being responsible for the SIG. In addition, it has been quite interesting working on a revision of the SIG handbook, looking at how the committees work and setting up guidelines for committee elections. Vicky: You engage a lot and successfully in social media. How did you start using them, and how do you think they help educators? Marjorie: I have to admit that I am a digital immigrant and have been learning how to use technology since I began teaching. But my first foray into active use of social media was when I finally took the plunge and got a smart phone. I was lucky in that two friends on holiday in Greece who were smart phone experts gave me lessons at the taverna every day at lunch so that by the end of the holiday I could use the apps on my phone. Through this I discovered the wonderful opportunities offered by groups like ELTChat which I take part in when my schedule allows. I also got on Twitter during that holiday and find it extremely useful for announcing events such as our upcoming PCE in Harrogate, our writing competition or the IATEFL BESIG conference I am organizing here in Graz. When I joined MemCom I began posting on Facebook pages to let people know about the webinars and in the meantime belong to a number of groups, mostly teaching organisations and associates of IATEFL. LinkedIn is another of the social media sites I belong to and I find that the conversation threads in the groups are very useful for professional development. But perhaps one of the most important parts of using social media is the chance to develop a PLN (personal learning network). Although I have been attending IATEFL conferences for a number of years, I have to say that last year in Liverpool was a truly new experience for me. I got to meet people from my PLN, went to their presentations and expanded my knowledge of what is going on the in the ELT world in a way I hadn’t been able to do before. And through social media and the PLN, we can stay in touch throughout the year. Vicky: You write a lot of class materials. What kind and what level are your preferred ones to write? Marjorie: I think at this point I have written for everything except for primary school although years ago I recorded a cassette with children’s songs in English. Here in Austria where I live, I wrote a series of books for lower secondary and am just finishing a series for upper secondary technical high schools. I have been writing for Cambridge University Press for almost ten years, starting with a book of photocopiable activities for business English. A few years ago I wrote two of the personal study books for the new Business Advantage Series, write regularly for the website, Professional English Online and just finished two projects for CD-ROMs to be used with coursebooks for the revised FCE and CAE exams. I have also written a book on banking for Pearson and revised a BEC Vantage book for Cengage-National Geographic. Last year at IATEFL I was thrilled to launch ‘Spotlight on Learning Styles’, my first methodology book published by Delta Publishing in the Teacher Development series. This had long been a dream of mine to do and working on it was an incredible experience. Vicky: Do you have any other projects in the pipeline you would like to share with us? Marjorie: There are several projects in the pipeline at the moment, although some are at very early stages. However, at the university I have just finished the second semester of a project with some sixty students on their learning styles by making use of learning styles questionnaires, self-reflection sheets and a final survey. I just brought the stack of papers home yesterday and am very curious about the data. This will be published as a chapter in a book put out by the university and I hope to be able to present on it at an upcoming conference. The other project which is going on at the moment is a module for ‘From Teacher 2 Writer’ on how to write activities for different learner types. Marjorie: I would like to say that it is really wonderful to have the chance to be interviewed by someone I so admire in the field of ELT. Vicky, you were one of the winners of our ‘best first presentation’ award at the IATEFL BESIG conference in Paris and what I love about the field of ELT is the support we give to each other. This has been an important part of my reasons for becoming involved in an organisation like IATEFL. The very first webinar we organized was with Professor David Crystal and it was truly inspiring seeing that we were reaching people across the globe who would normally not have the opportunity to take part in such an event. This inclusive atmosphere and sense of community is essential to me and one of the main drivers for working within the IATEFL organization. Vicky: Thank you so much for your kind words – they give me a lot of strength! And a huge thank you for this wonderful interview. 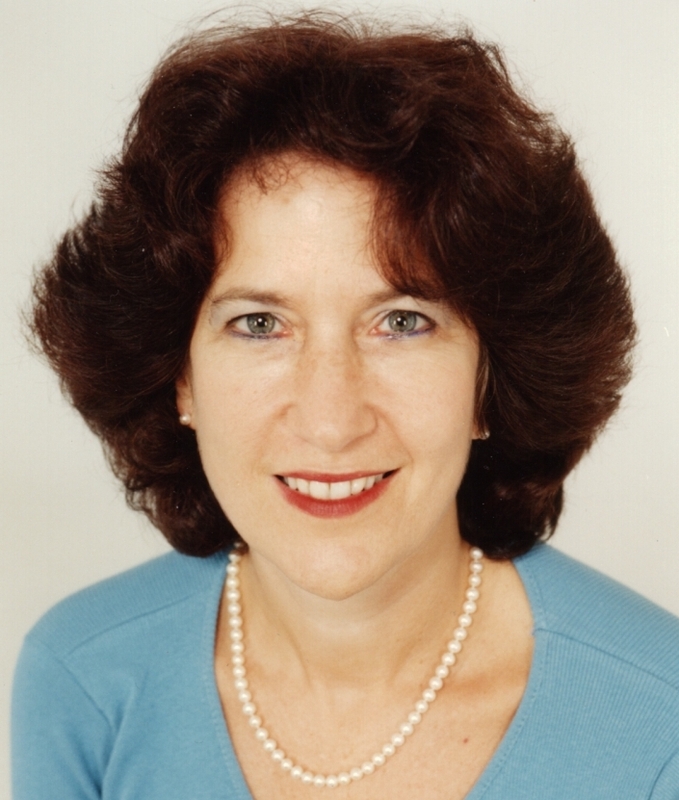 She has also written articles for English Teaching Professional and The Teacher Trainer and TA journals and newsletters. 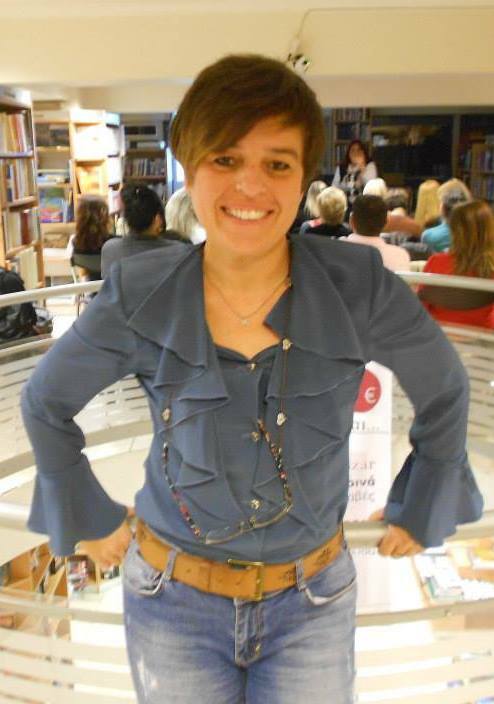 She writes regularly for the Cambridge University Press website, Professional English Online (2011 – present). Smiling and always thinking about her students, here is Aphrodite Giouris! I am very happy to present Aphrodite Giouris, an English language teacher in Greece who does amazing things with her students! Aphrodite is a firework – she is one of the most enthusiastic and dedicated teachers I have ever met and feel privileged to feature her here. She blogs at ELT Inspired. Over to Aphrodite! Vicky: Aphrodite, thanks so much for accepting to give me this interview! We have met once in person, but also connecting with you on social media has been great for a variety of reasons we will go into in this interview. Aphrodite: The pleasure is all mine, Vicky! I still remember the time we met in person during the last TESOL Greece Convention in Athens! At the end of your presentation on blogging, I told you that if I ever manage to have my own blog, I will tell everyone, that it was because of YOU! You have been my inspiration to start blogging, Vicky and I love following you on social media. Your positive energy, passion, kindness, professional commitment, sweetness, friendliness and above all, inspiring aura, are what make you a very special person! Vicky: Thank you ever so much for all your kind words, which give me a lot of strength! I am so happy you have started to blog, because you have so many things to teach us and share. Let’s go a bit back in time now. How did you become a teacher, Aphrodite? Aphrodite: I was only 12 years old when I wrote in my diary: “Dear Diary, when I grow up, I want to be either an English teacher or a journalist”! I was lucky enough to have experienced both, so far … I spent most of my time, when still in university, writing for newspapers and magazines in Athens and worked for about two years for a local TV channel, as a reporter. I have also been teaching English, since I was a university student! I became a teacher because I believe teachers can make an impact. I think about my impact on the world often, honestly, sometimes too often. Teaching kids and dealing with them feels good, as in no other job. I feel great about the fact that I might be playing a significant role to inspire them build their future and that feeling enriches me with a sense of responsibility. I have always wanted to impact lives and improve the quality of education; considering the fallout in my country’s educational system. My Greek teacher in high school Mr Vasilis Siouzoulis, has being a great inspiration. I love the way students regard him despite decades of passing through his tutelage. He was passionate about what he did. He motivated me with his unique teaching style. I love children and gearing their developmental stages positively. I believe it is earnestly imperative to groom conscientious, focused, purposeful students who will combine efforts with already laid brass tracks to build a great world. I want to be known to teach my students beyond their books. Why I became an English teacher in particular? Well, I just love communicating with people all over the globe! And foreign languages, especially English which is an international language, is the most powerful tool to do that! The English language has helped me to be the person I am today. I have gained my education because of that ability to comprehend, use & manipulate the English language. I have repeatedly informed my students about English being a weapon for them to use in order to obtain knowledge, progress in life, achieve their dreams and be the best that they can be. I learned english because I wanted to succeed in my life, too. It is as simple as that! I love to know more about the world around me, the planets, the stars, the universe, the mysteries … the language with which I can know more about so many things & wonders is mainly the English language. We are not in this profession for money! Our students’ love and appreciation are all we need to feel happy! I sometimes wonder why I get paid for something I love doing so much and which is so rewarding ! I could have been a teacher, even without a salary! It’s merely because I love what I do! I really do! 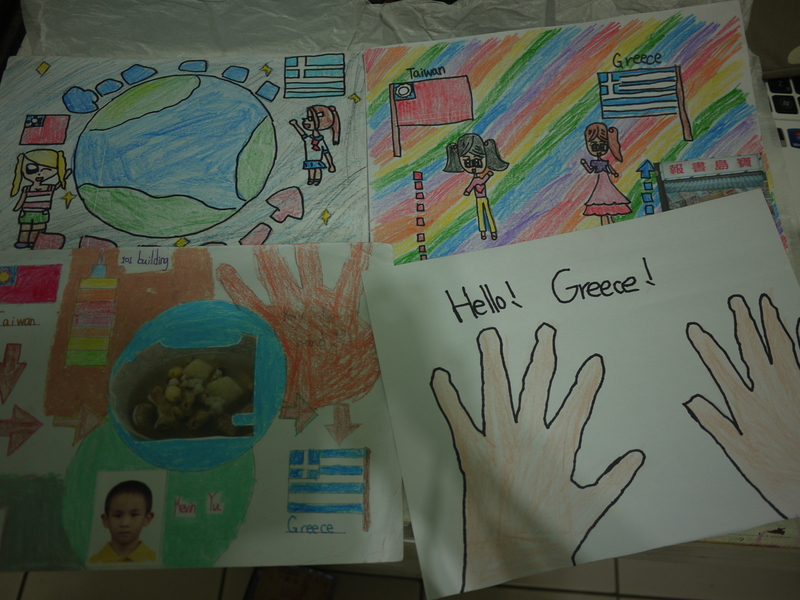 Aphrodite’s kids holding up the beautiful work they received from Annie Tsai’s kids! Vicky: I couldn’t have said it better – your passion and dedication shine right through. Now about the lovely people in your classes – can you tell us a few things about your wonderful students? What levels and ages do you teach? Aphrodite: I currently teach primary school students aged 9-12 but I used to teach all levels and ages in the past. I worked in the secondary sector a few years ago and in local Technological Institutes and private schools and institutions. My school is a small school in the suburbs of a Greek town in central Greece. There are about 180 students in my school and 25 students in each of my classes this year! Difficult to teach in such large classes but I try to do my very best, regardless of the negative circumstances! The majority of them come from Greek middle class families. We also have many students whose parents have come to Greece from other countries to find a job. The Greek financial crisis has affected us all at school, in several ways… Teachers, as well as the majority of our students’ parents, have suffered dramatic wage cuts, but we are not fighting for money or privileges, as many people think. We are fighting to save education. Most of our schools lack all the basics and all our students have been affected directly or indirectly by the crisis. When I step into the classroom every morning, I leave all my problems outside! I start the day with a smile! My students deserve my best smile! I teach them life skills during the first week. I teach them goal setting. I want them to be optimistic, hardworking, dreamers, fighters….they are the future of this country! What we put in, we take out! I personally put emphasis on team work! When students form a group, social skills kick into action. Kids must learn to work together and cooperate. This is an opportunity to make friends and talk with others — networking can start in the classroom. This is a chance for the kids to expand their vocabulary, work on patience and learn how to take turns. Conflict resolution may also become part of the learning equation. Each student can benefit on a personal level from teamwork. She can feel like a valued part of the group as she contributes to the project and shares her ideas, which can build confidence and self-esteem. The student will be exposed to new ideas and ways of thinking, which can expand her personal view on the subject. Teamwork activities can be the time for each student to shine and show others her skills and talents. Visible thinking – the kids’ work on the classroom wall! Days can get long and dull when you have a group of kids that are disconnected and staring at the walls. Group work is a welcomed change in the normal routine and gets the kids out of their seats. Schoolwork becomes more enjoyable and rewarding,then….I have recently written about the importance of teamwork in my class in my Blog! My students are adorable but, my classroom is not…paradise on Earth! I hope, when all this is over some day, to have made the difference in, at least, ONE of my students’ life! Vicky: One of the things I truly admire about you, is that – against all odds, in a time where education gets very little financial help in Greece these days, as you mentioned – you have managed to build an amazing environment in your classroom for the kids, full of colours, projects and visible thinking, to borrow the term from Project Zero. What gives you the inspiration for all these ideas? My PLN is my second source of inspiration! In order to be able to put my ideas into action though, financial help is really important … I have been struggling to raise money to run my projects and work in class, either by asking – begging the parents’ associations for support as well as the several publishing houses out there (which, at least, have donated some books to our English library) or by organising school bazaars, just to be able to keep a small amount of the money earned, for our English class needs. It has been HARD work all these years, have to admit that! Many years have passed since the beginning of my teaching career … but, nothing much has changed! I mean, I keep working on several projects with my classes, we continue exchanging our projects with more than 6 schools all over the globe every school year, I still do my best to have at least one -handmade – magazine made each school year , but still….. I work in schools with no computers or other facilities, I work extra hours .…earning nothing but my students’ love, have had no chance to take part in a Comenius partnership yet (due to several reasons which have NOTHING to do with my willing to do so). There’s nothing more rewarding for a teacher than to see how happy , engaged and enthusiastic her students become when they work on something that makes sense and connects the class with the world! It’s priceless! Believe me! It’s worth any effort!It brings the class together, it helps the teacher connect with the students more and the students connect with their peers all over the globe by means of an international code of communication: English! If the longing for the goal is powerfully alive within us, then we shall not lack the strength to find the means for reaching the goals! 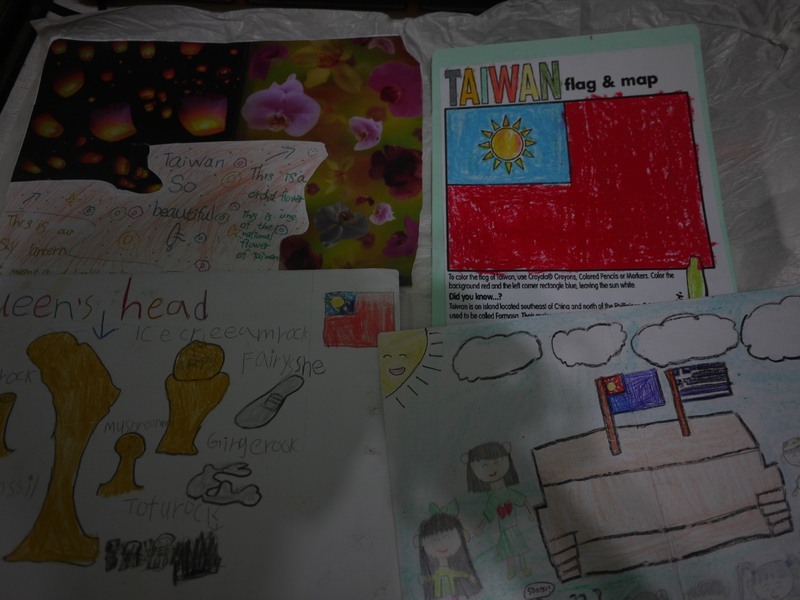 Vicky: You have started an amazing pen pal project with other countries. One I have seen in detail is with Annie Tsai’s class in Taiwan (Annie is one of the next educators to be interviewed on the blog!). How did it start and what kinds of exchanges have you had so far? Can you give us some insight into your students’ thoughts and feelings? I am sure they are thrilled! Aphrodite: Annie Tsai has been a blessing for my students! She is an amazing educator in Taiwan and I am so thankful we have been collaborating for some years now! Well, I have been working on projects since the beginning of my career as an English teacher. When I had to to travel all around Greece to work. Even when I had to change the school I worked in, every single year or I had to work in 3 different schools in the same day!I had to walk long distances carrying my heavy bag and some years later, had to drive to a different village school during the…. break. Our first partners, were colleagues I had met in my seminars abroad or, my own ….pen pals ! My first pen pal, when I was 11, Julie Barbie, who still lives and works in North Carolina, USA, was one of my first partners! We both became primary school teachers and it was so touching to have our kids experience the same thing. I have practically collaborated with schools in almost all continents. Yet, one is missing: Australia, which is my next target. Project work, goes like this: we send our partners a project on a topic we have both decided upon. They reply by sending us the same topic project. How fascinating for our students to share and compare! Arts and craft, play an important role in all our projects! Unfortunately, there is not an Arts teacher in my school. 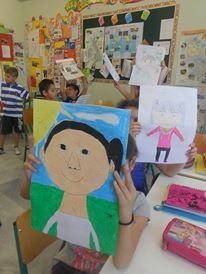 I am the only one who can help my kids with the artistic part of the projects. Imagination is more important than knowledge because, it has no limits. 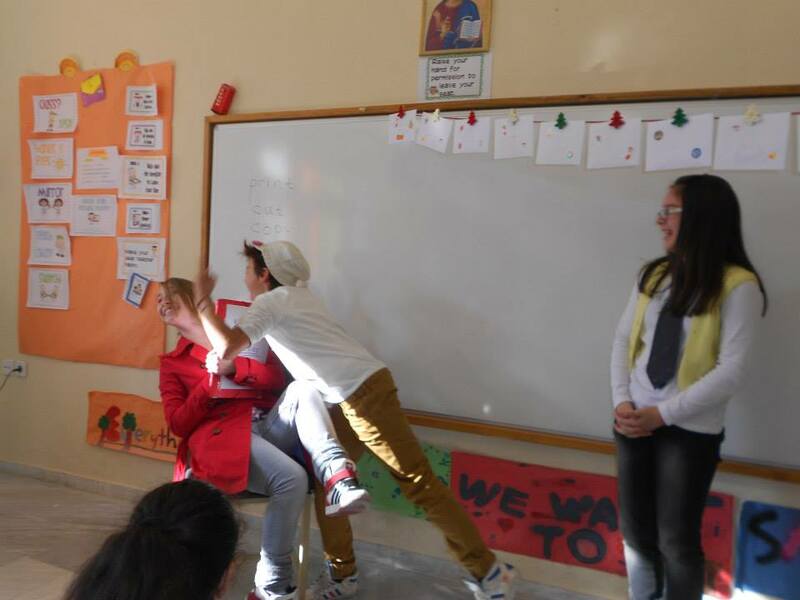 Drama plays a very important role in project presentation..Project presentations become more interesting, when drama is involved! 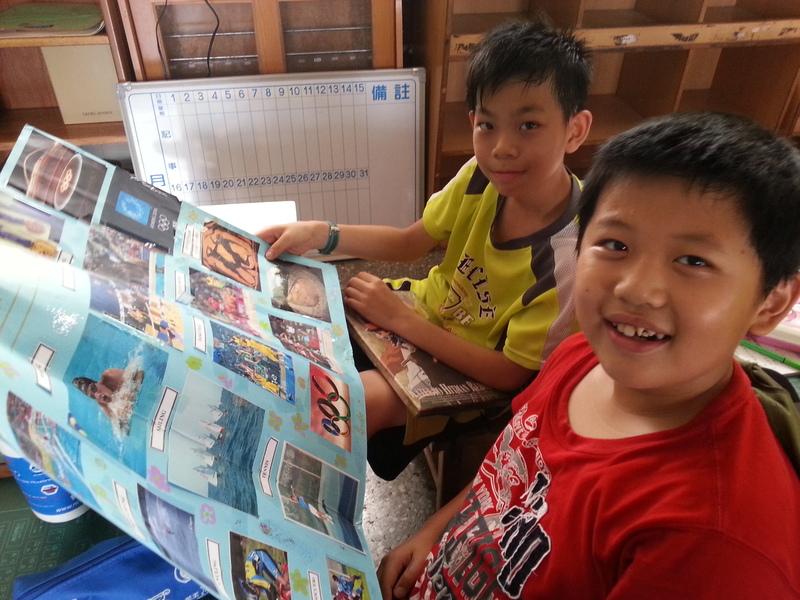 Kids really have lots of fun – but the most important thing is that, these projects don’t remain in our classroom. They travel away to other classrooms! 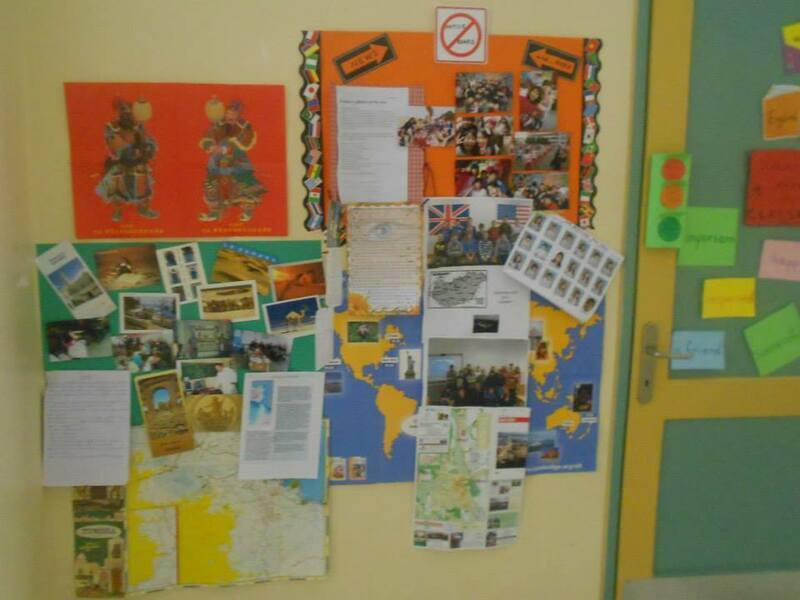 It’s just amazing for my students, to see their project work in another classroom, so far away from home! 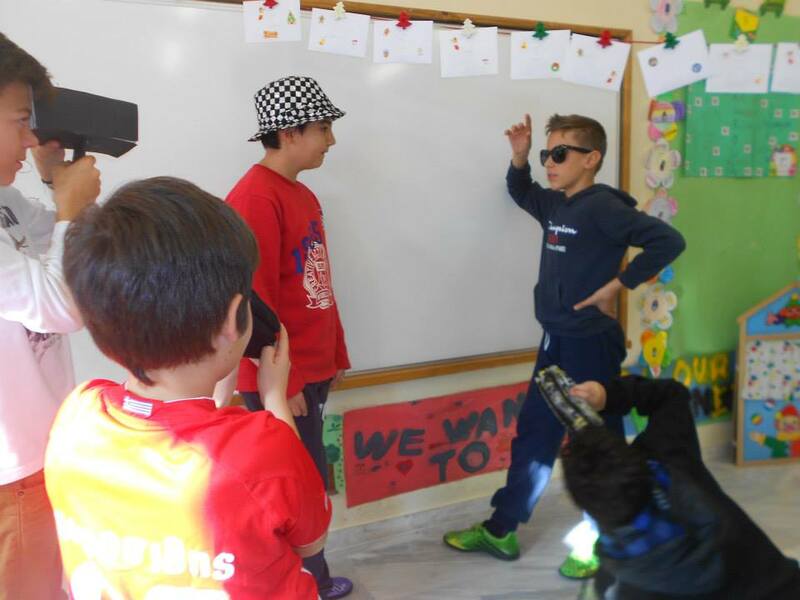 ….Sharing and comparing, is what makes this projects exchange with schools abroad, a unique experience for my students! Vicky: All this is fantastic Aphrodite! I hope one day I can visit you classroom and see you all in action. Speaking of sharing and learning, you also engage in social media. How do they help educators? Aphrodite: In Greece and everywhere, teaching has always been an isolated profession. Teachers were limited to sharing the experiences of their colleagues in their building or district. If they were in the group of a fortunate few, they might have gotten to experience a professional conferenceechnology historically allowed learning to expand from face to face contact to distances beyond the limits of both time and space, and the Internet has moved that to a whole new level. I am grateful for social media and my PLN, in particular! If it wasn’t for them, I would never have had the chance to connect and share with you, my awesome partners all over the world and have been able to learn so much and become a better educator myself!…. Vicky: Aphrodite, you have recently started an amazing blog with a lot of sharing of great ideas. Can you tell us more about it? Aphrodite: I have to repeat, that it was because of YOU, dear Vicky that I started thinking about creating my own Blog! YOU were my inspiration, when I watched your presentation on blogging , during the TESOL Greece convention in 2013 in Athens! I can’t thank you enough for that! Blogging has already opened new perspectives in my teaching career… In today’s social media world, many of us share the details of our lives with friends on Facebook or by text message. As a teacher, I have a powerful opportunity to model blogging as thinking, using a teacher reflection blog or a teacher area within my blog. Share my teaching philosophy with colleagues, model blog writing style, and show my openness to comments and feedback by participating as a blogger “in front of” my PLN and the world! I can show that me , too, enjoy learning every day. I do my best to post regularly so everybody can see that I value blogging (maybe every week or two?). My blog is only about 2 months old…It is about various aspects of my life as a teacher. I talk about teaching ideas and tips, about my life as a teacher of ELT,and sometimes about things outside the classroom. I was surprised to find out a week ago, that although my Blog is a newcomer to the blogsphere , has already been nominated for the “ABC award”! I have to thank “Sincerely Kate” ( http://sincerelykaterz.wordpress.com) for this honor! Vicky: That is absolutely fantastc news! And now, we have reached the end of the interview. What would you like to tell everyone reading your interview right now, as a closing comment? Aphrodite: Being a teacher means being there, giving everything I can, making sure I am as knowledgeable as I can be about my content and about my students’ lives; it means sacrifice for the sake of helping kids in need and it means caring about students unconditionally. I am not a teacher for me–I am a teacher for my students. When teaching becomes about me, I assure you, I will know it is time to stop teaching. Being a teacher is exciting, enjoyable, and REWARDING!!!! I get no greater thrill than seeing my students achieve. I am constantly in awe of my students and their abilities. Being a teacher is NEVER about counting down the last days of the year, but rather, to rue them, because I will lose yet another class to the high schools. I am JUST an ordinary teacher, Vicky! I just happen to love my job. Thank you so much for the opportunity to share my work in a small Greek classroom with the world! Vicky: Thank you so much, Aphrodite and I am so happy we will meet again face to face in March! I am thrilled to have an educator I admire very much on my blog, not only for his teaching and his sharing, but also for his studies and blogging as well! I would like to introduce you to Osman Solmaz – originally from Diyarbakır, Turkey – now in Tucson, Arizona for his PhD studies. Vicky: Thanks so much for accepting my invitation for this interview, Osman! Osman: Thank you for the offer! It is my pleasure to be part of this! Vicky: Thank you so much – I admire you so much as an educator! My first question is that exactly, how did you decide to enter the world of education – has it always been a dream of yours? 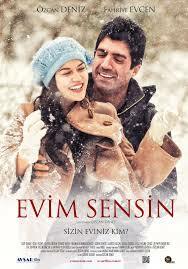 Osman: I had (still have) an amazing teacher of English that helped me a lot to become who I am right now. I think the influence of the teachers like him affected my decision; because I have personally witnessed how a teacher can have a deep impact in the lives of his/her students. Besides, I have always had an interest in learning languages and foreign cultures. Even though I started learning English at high school, I loved the whole process of developing a competence to express myself in another language. I hope to help my students to enjoy this process and much more as much as I did. Vicky: You are also contiuing your studies – you are doing a PhD in Second Language Acquisition & Teaching at the University of Arizona. How did you choose this specific program? How are you enjoying it so far? Osman: Second Language Acquisition and Teaching (SLAT) is an interdisciplinary doctoral program in which 17 different departments participate. So, when you are enrolled in a program like this, you have a chance to collaborate with almost 80 professors. Even though this rich variety of options can be challenging for students, the steps to take in your PhD quest in the program are clearly stated. Needless to say, it is one of the best programs in the country partly thanks to its unique nature. Therefore, SLAT was in my radar from the first day I came across the program on the web. It is my second year at the moment here and I have truly enjoyed the people, the program, classes, professors, and beautiful Southern Arizona so far. People in my program are really friendly and they make us feel like a family. For example, we have had a Halloween party few weeks ago and it was mostly for international students to experience the Halloween culture. We have a Thanksgiving dinner on the corner! Vicky: Before Arizona, you were in your beautiful country, Turkey. Can you tell us what you were involved in while you were there? Osman: I studied at the department of English Language Teaching at Dicle University in Diyarbakır (hometown), a historical and vibrant city in southeastern Turkey. After teaching English to adults in a private course and then high school students at a private school, I have lectured at the university for a couple of years before Arizona. While teaching at the department of foreign languages, I received my M.A. degree in Applied Linguistics / ELT from Dicle University. I hope to be back once I am done, but it is early to speak yet. 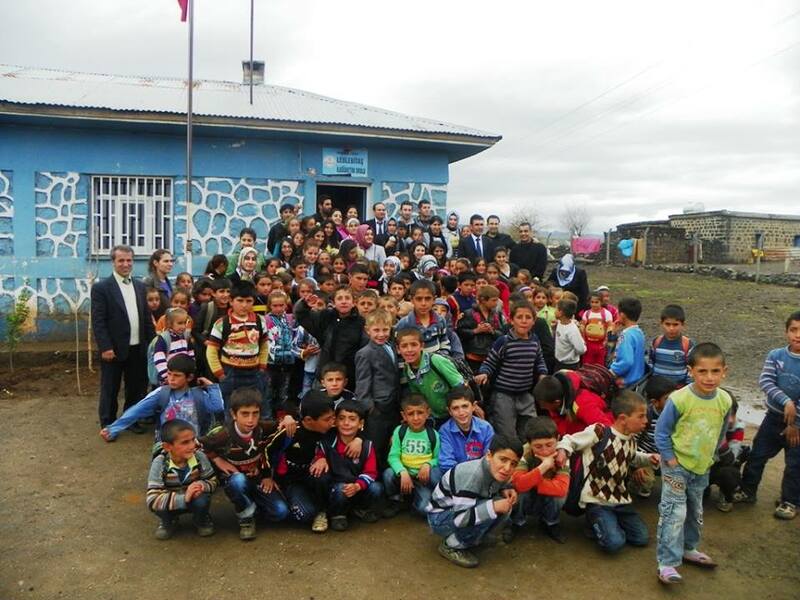 Osman and his students (English language teacher candidates) while reaching out to the students in a rural village as part of a community service project they developed together. Osman: When I posted my very first tweet, I had no idea how powerful this tool would eventually be. I must admit that I was very lucky to come across #eltchat which helped me grow up as a language teacher and introduced me to a great group of colleagues with similar interests. I think of the social media as a giant and efficient teachers’ room where educators are constantly in touch. Social media helps educators become better teachers since the engagement and activity on the ‘virtual teacher room’ help us be exposed to education-related news and materials all the time. I think this makes us become critically aware of the process of learning and teaching. In the meantime, social networking allows users to form friendship and give us some friends to chat and hug when we attend a conference, instead of just presenting and coming back home. The process of getting involved with potential conference participants starts long before than it used to be and I think it is great! Last but not least, I believe we all should try to understand the core promise of how a technological tool can assist us with our teaching. It is Facebook, Twitter, or Pinterest today, but there may (and will) be different technologies in the future and we should prepare ourselves for them. 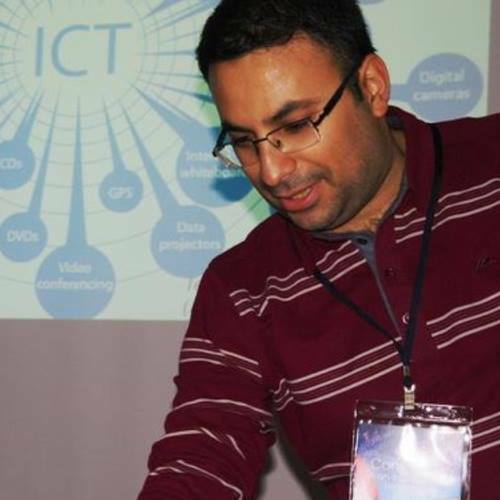 Therefore, I am interested in researching the connection between technological tools and how we educators can make the most of it. Vicky: You also have a beautiful blog, idiolectica. I love how you incorporate various topics – apart from teaching, you have literature and recently you added a new category, Joys of Life. 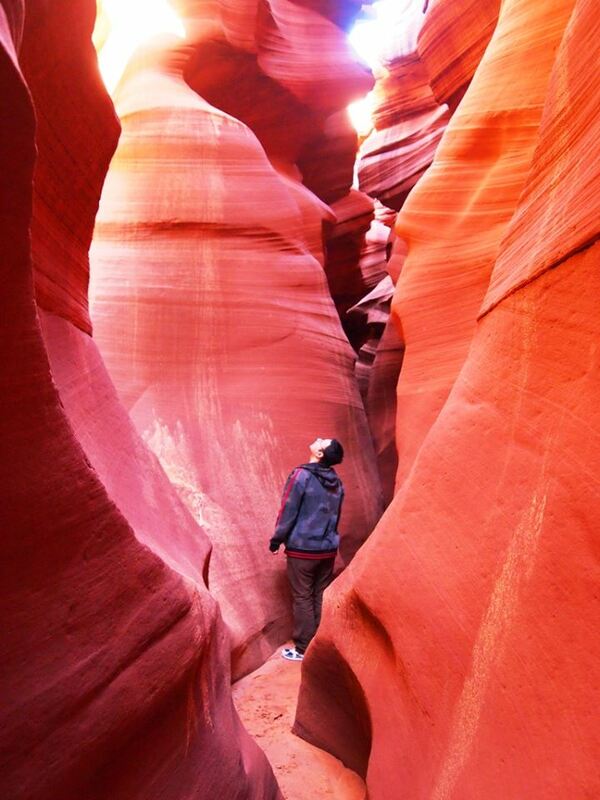 Can you let us know what inspired you for the name of the blog and what inspires you to write? Osman: Thank you! I made up the word idiolectica! I haven’t personally seen that word anywhere. Idiolect is the unique linguistic system of an individual and –ica is “a collection of things that relate to a specific place, person etc.” (-ika in Ancient Greek). This makes me come up with the word idiolectica referring to the collection of things related to my own linguistic system. I chose this because I am thinking aloud in my blog and I like writing about the things I read and come across. In addition to that, my individual perspective is clearly reflected on all the blog posts (except guest posts). I think living in a foreign country, being enrolled in a graduate program far from home, having various interests, and surely reflecting on educational / linguistic / sociolinguistic issues are among the factors that make me write. It is definitely not a typical educator blog but I hope people like it and encourage me to continue writing. About Joys of Life, there are many small things in this life that can make us happy and happiness is most valuable when shared. That is why I started that category and I want to continue sharing the joys of life! Vicky: That is so important and thank you for reminding us and helping us focus on all the great things in life! What would you like to tell all the educators who are reading your interview right now? Osman: As teachers, we should have the desire, passion, and the knowledge to help our students become better learners. In order to achieve this, we must be great learners ourselves. Remembering our teachers being proud of us for being who we have become and students appreciating our efforts help a lot along the way. Vicky: That is an amazing statement to close our talk. Thank you so much for this interview and I hope we meet up in person soon! Osman: I thank you for helping educators meet educators through those great interviews and I am sure we will meet in one of the language-related events very soon!